Spring has officially sprung and it’s nice to be able to get out in the garden once again, and the best thing any pet owner can do is to be educated on potential garden dangers, as some of the plants and products we commonly use in our garden can be very toxic to animals. 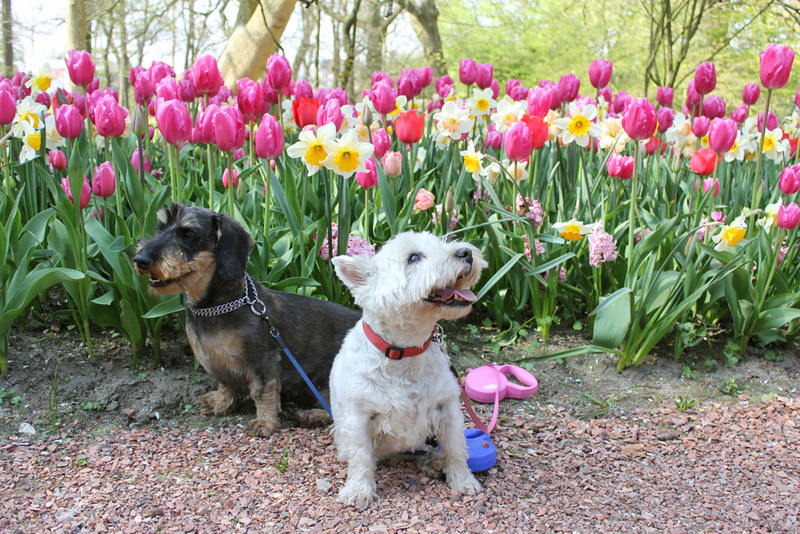 The spring bulbs of tulips and daffodils are particularly toxic to dogs and cats; although all parts of the plant are toxic, it is the bulbs that actually contain the most toxins, so be extra vigilant and make sure you dog isn’t digging up bulbs in the garden. Lilies can also pose a hazard and are particularly toxic to cats, with some species worse than others. The more dangerous varieties are true lilies and these include Tiger, Day, Asiatic, Easter and Japanese Show, and if digested can result in kidney failure. Two other plants to be aware of are the spring Crocus and Lily Of The Valley, if your pet is seen chewing or digesting any of the above and shows symptoms of excessive drooling, vomiting, diarrhoea or respiratory problems, we recommend seeking veterinary care immediately. Most slug pellets containing the chemical metaldehyde are toxic to pets, so take great care if using these keeping pets away from areas where they are used and stored. There are pellets which are pet friendly or you could consider using a barrier or trap control product instead. Cocoa shell mulch is also to be avoided if you have a dog, they are attracted by the smell but it contains theobromine a very poisonous substance, as a result it is safer to use an alternative such as tree bark. As a general rule, when adding anything to your garden, ALWAYS read the label carefully regarding the hazards to pets and worry not, as there are many pet friendly alternatives on the market to keep your garden in full bloom…. One last thing to look out for is the European Adder, the only venomous snake native to the UK. Adder bites are generally seasonal, the majority occurring in the spring and summer months and can be extremely dangerous, particularly if an animal has been bitten on the face. Bites may result in severe swelling which is generally seen within a few minutes to a few hours. There may also be pain, distress and sometimes bleeding. It will come to no surprise that chocolate is the number one food to avoid your pet getting its paws on. Make sure no uneaten Easter eggs are lying around- which makes the perfect excuse to gobble them all up! Nuts and raisins are also very harmful for your pet so best to keep those out of reach too. Read more about what to do if your dog has eaten chocolate! The bites of fleas can cause irritation and allergic skin reactions in pets, and ticks can pass disease, the most common of which is Lyme disease. As with most things, prevention is better than cure and keeping on top of the problem with a herbal routine can be very effective form of prevention, and can be used alongside over the counter medications if needed. Garlic and Pennyroyal are two of the herbs that are great deterrents and provide a hostile environment for parasites. Garlic Tablets are often used on a daily basis to keep a sufficient level of garlic in the bloodstream to help repel these blood sucking parasites and you should give one tablet per day for every 5kgs of your pet’s weight. During periods of severe infestation, and if you can live with pungent aroma, you can comb Garlic Juice through the coat to provide additional protection. Remember to wash your pet’s bedding regularly at this time of the year too, to make sure there are no flea eggs or other nasties lurking there. Pennyroyal herb has been used throughout history to prevent and deter parasites because of its strong minty aroma, and although it must not be given internally, it is very effective for pets when used externally, as in our Pennyroyal Shampoo. Young dogs love to chase insects and this means they are liable to be stung on occasion. While usually this is harmless, there is the risk of anaphylactic shock resulting from bee or wasp stings, in which case veterinary help must be obtained immediately. For minor bites or stings, first clean the site with Garlic Juice and then give the homoeopathic remedy Urtica Urens 30C to give relief and reduce swelling. can be really tasty for dogs and cats as they are soaked in all of the meat juices. Meat joints are often wrapped in string, however these can get stuck in throats, so please ensure your pet does not have access to the strings and take care when disposing of it. ….and don’t forget should you need it there is always help at hand, so if you have any worries do contact your vet for further advice. You can also check the Veterinary Poisons Information Service. Now we’ve got the horrible stuff out of the way, it’s good to be reminded that Spring also brings with it a wealth of wonderful things. More daylight hours means lighter evenings which are great for walking the dog, and warmer temperatures means the overcoats, wellies and rest of the winter dog walking kit can be put away for another year. Buttercups, primroses and other wild flowers start to bloom and birds can be seen building their nests in the hedgerows, and we can all (pets included) connect with nature and its beautiful sights and smells once again…enjoy! 2 thoughts on "6 Springtime dangers for pets"
Do you have any further advice about not feeding nuts to dogs. please? I have been in the habit of giving the occasional walnut or almond to my dog! Hello. Like all dogs, they may be allergic to anything so if you are worried about allergies make sure you visit your vets. If they have no effect on your dog it can be part of their diet but again it is best to check with your vet and make sure the nuts are natural e.g. not salted or roasted etc.